Because the articles were never published, PLD Lamplighter is publishing links to their censored articles as a show of solidarity to fellow student journalists. Texas newspaper Prosper Press offered to publish the school newspaper’s censored articles. 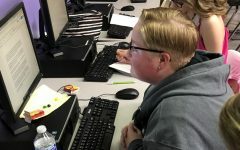 A Texas high school newspaper staff has reached out to the Student Press Law Center and Journalism Education Association to assist them in a battle against censorship. 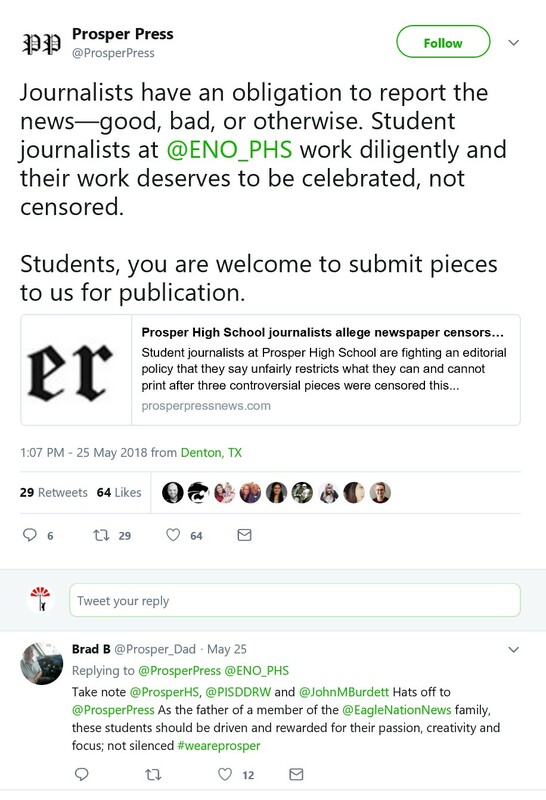 Prosper High School’s student news site, Eagle Nation Online, has been repeatedly censored due to administrative prior review and restraint. 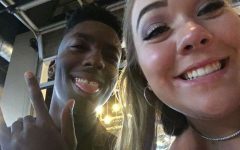 The principal of Prosper High School, Dr. John Burdett, said that stories “made the school look bad,” so they were removed. The student staff members brought their case to the Student Press Law Center who wrote a detailed article about the situation. In October 2017, an article written by copy editor Isabella Abraham criticizing the school’s decision to cancel a “movie day” as a prize for fundraising was removed from their site because it was not “uplifting.” The article begins, “The class raising the most money for Cash for Cancer will not win a movie day as previously announced…District officials decided last spring that students would not see a movie, however, they did not convey the message to current administrators until last week, according to principal John Burdett.” Read the full article here. 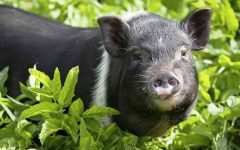 In February, another article, this one written by Haley Stack, was censored because it criticized the removal of John Knowles’ A Separate Peace from the sophomore reading list. The article begins, “Life of Pi, which has been challenged in classrooms before, has been added to the sophomores’ curriculum in replacement of A Separate Peace. [It] was removed from the 10th grade curriculum for unclear reasons on Monday, Feb. 5. The banning of an intellectually challenging and thought provoking book is wrong in it that it blocks a student’s understanding of the world.” Read the full article here. On May 1, the staff was censored for the third time when Editor Neha Madhira tried to publish an article about the April 20 national school walkout. The article begins, “The school’s team-bonding activity April 20 may have been a “remarkable moment of solidarity,” as Principal John Burdett said in his newsletter from the office, but it was unfocused and chaotic on the east side of the main hall. If we want an event like this to succeed and serve the purpose of the student body coming together, things need to change.” Read the full article here. In addition, the contract of Eagle Nation Online’s adviser, Mrs. Lori Oglesbee-Petter, was not renewed. The students stated that they believe the dismissal of their adviser was retaliatory. PLD Lamplighter’s incoming 2018-19 editorial board, led by Editors-in-Chief Abigail Wheatley and Olivia Turner, decided to support Eagle Nation Online by giving their censored articles another forum, and to show solidarity with student journalists.